This morning you will be transferred to the airport for your flight south to Bohol island. The beach extension is unescorted, however a rep will be on hand to meet you on your arrival to fascilitate your transfer to your beach resort. Your time is free to relax and enjoy the tropical surroundings. Enjoy the beautiful surroundings of Alona beach. Relax further or perhaps venture out to explore the island. Today you will be transferred back to the airport for your flight to Manila airport where the tour ends. Binoculars, torch, water bottle, insect repellent, high factor suncream (at least factor 15), good quality sunglasses and a lip salve with sun protection. You may also wish to bring your own snorkel and mask for Bohol. For adventurous and energetic travellers with a little more time to spare this is the ultimate Philippines trip as you have the chance to rest on stunning white sand tropical beaches of the island of Bohol at the end of an exciting trip which has some early starts, long journeys and a volcano to climb! 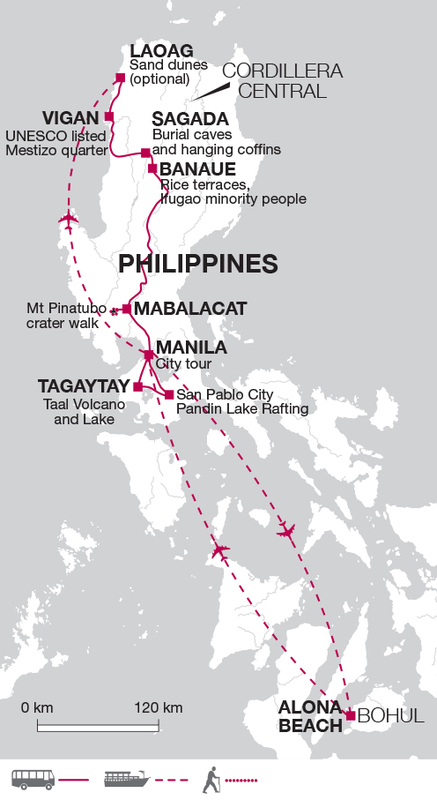 The Philippines have been listed in the Top Ten destinations to travel to by the Lonely Planet in 2015 and we believe this trip showcases the diversity of the landscape and culture of the Filipino islands of Luzon and Bohol.